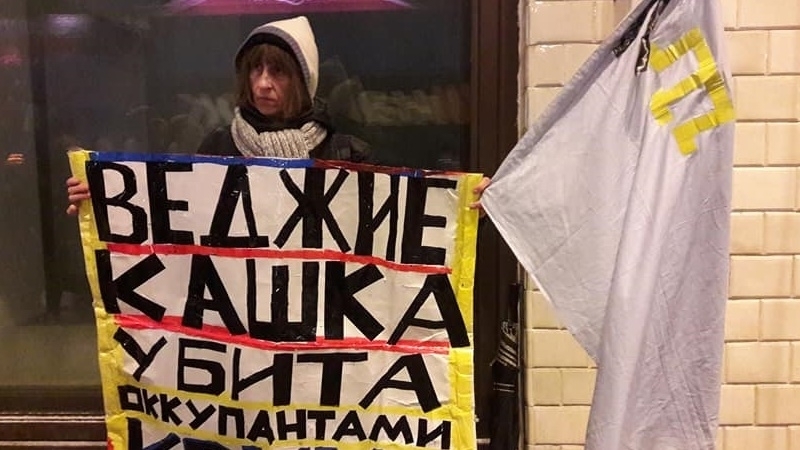 November 30, in the capital of Russia activists of human rights organizations and opposition forces took part in solitary protest actions in connection with the killing of veteran of the Crimean Tatar national movement Vedzhie Kashka due to the invaders’ actions in Crimea. Vera Lavreshina provided information on the events on her Facebook page. The activists held a national flag of the Crimean Tatars and posters with the inscription: "Vedzhie Kashka was killed by the Crimean invaders". The pickets were held within the framework of the "Strategy-30" (the initiative of the Russian opposition, which protests against restrictions on freedom of assembly on the 30th of every month). The activists protested against the detention of Crimean Tatars on the annexed peninsula. “In the Crimea during regukar raids, Vedzhie Kashka, a legend of the Crimean Tatar peace resistance, was killed. She survived many deportations, more than four times returned to the Crimea after she was deported. During the raid, she was actually killed. She had a heart attack and she did not even reach the hospital. We condole with the Crimean Tatar people and believe that the criminals who are involved in the searches will be punished, including Putin," said one of the participants of the pickets. Russian activist Vera Lavrishina said that the story of Vedzhie Kashka is the story of the struggle of the Crimean Tatar people for their return to homeland. “Her house for many years was a meeting place for activists of the movement. And she an activist until the last day of life actively participated in the national movement. But the invaders killed her during another raid. Vedzhie could not stand it," she said. Lavrishina expressed her condolences to the Crimean Tatar people in connection with the death of Vedzhie Kashka. “We share the grief of the indigenous people of the Crimea, and also express our outrage in connection with such realities. The bandits who occupied this fertile land, consider themselves masters where they were not invited, "she noted. November 24, the Crimean Tatars paid their last respects to the heroic woman, veteran of the national movement Vedzhie Kashka, who was buried in the village of Novoklenovo (Üç Köz), where she lived in recent years. QHA reported that people from all corners of the annexed Crimea came to the farewell ceremony for Kashka. About 5,000 inhabitants of the peninsula took part in the Muslim ceremony of the funeral. November 23, after the searches and detentions held in the Crimea by FSB officers, the veteran of the Crimean Tatar national movement Vedzhie Kashka died.